Margaret McIntosh and Rio Rio. Photo (c) Lindsay Y. McCall. Jupiter, FL – April 5, 2016 – Horse Radio Network’s once-a-month Para-Equestrian Show featured equestrians Margaret McIntosh and Katie Jackson with hosts Lindsay McCall and Regina Cristo. To listen to episode #357, please visit: http://www.horseradionetwork.com/2016/04/03/dressage-radio-episode-357-by-uspea-getting-ready-for-selection-trials-and-a-newcomer-preps-for-nationals/. About Margaret (Gigi) McIntosh: Margaret McIntosh broke her neck in the spring of 1999 while riding in an event, resulting in incomplete quadriplegia. Initially paralyzed from the chest down, she is eternally grateful for having the opportunity to regain her mobility. McIntosh had extensive riding experience before her accident: 1970-1976 Working student for May and Denny Emerson; 1976-1979 Working student and barn manager for Gunnar Ostergaard and Ellin Dixon; 1979-1983 Working student/groom George Theodorescu in Sassenberg, W. Germany; from 1987 through 1999 Gigi evented several horses with lots of help from Bruce Davidson, culminating in completing the CCI*** and CCI**** at Rolex Kentucky 3-Day in 1997 and 1998. Six months after her accident she began riding with Jane Cory, the owner of the Cort Center for Therapeutic Riding at Pleasant Hollow Farm in Pleasant Valley, PA. She initially asked Missy and Jessica Ransehousen for help just before the World Equestrian Games in 2010 and has enjoyed their expertise ever since. In 2012, McIntosh qualified for the London 2012 selection trials including successful trips at back-to-back CPEDI ***s in Wellington, FL. McIntosh was also the Reserve Champion at the 2014 USEF Para-Equestrian Dressage National Championships. Married since 1983, with two grown children (Charlotte (27) and Cameron (25)), and her husband, Brian, a retired banker. McIntosh is now aiming at the 2016 Paralympics in Rio Di Janeiro with her own Rio Rio. About Katie Jackson: Katie Jackson was born and raised in a small town in Southern Oregon. Always a bit horse crazy, her mom finally gave in and Jackson took her first riding lesson on her sixth birthday. Jackson continued riding through high school and always found a way to keep horses in her life through college and dental school. Jackson attended the University of San Diego for her undergraduate degree, receiving a bachelor’s degree in Biology. For dental school she decided to stay in California, attending the UCLA School of Dentistry. After dental school she did a postgraduate residency program for general dentistry which took her to San Antonio. While in San Antonio she fell in love with a Texan who happened to live up the road in Austin. Jackson and her husband have called Austin home for nine years. Jackson currently owns and manages a private dental practice in north/central Austin. When not at the office, she is out at the barn or outdoors with her husband and two labs. Jackson’s life changed last summer when she went to the doctor for a second opinion on the pain she was having behind her knee. At 35 years old it was quite a surprise to be diagnosed with cancer. The type of cancer she had was a rare type of soft tissue cancer known as a Clear Cell Sarcoma. Amputation of the leg above her knee was her only option to make sure this aggressive cancer was removed. “I feel very fortunate that my recovery has gone as smoothly as it has,” said Jackson. As soon as she could, she was back out at the barn. Being around horses has been not only therapeutic but also a big motivation to work hard on her physical therapy. In January Jackson went to Florida to watch the CPEDI3* in Wellington. For Jackson it was a worthwhile experience getting to watch the riders compete and to also attend the symposium featuring FEI 5* judge Carlos Lopez and U.S. Team Chef d’Equipe Kai Handt. Whence returned two weeks later to watch the second CPEDI3* she received her official classification as a Grade IV Para-Equestrian. In February, Jackson went to Dallas to ride with Kai Handt, hoping to have him evaluate her riding. On that day Jackson had the opportunity to ride multiple horses and fell in love with one sweet, bay gelding. Jackson now calls that gelding Wembley her very own. In March Wembley and Jackson went to their first show with a goal of qualifying for the U.S. Para-Equestrian Dressage National Championships. The duo completed their goal and will head to Michigan in June for the National Championships. 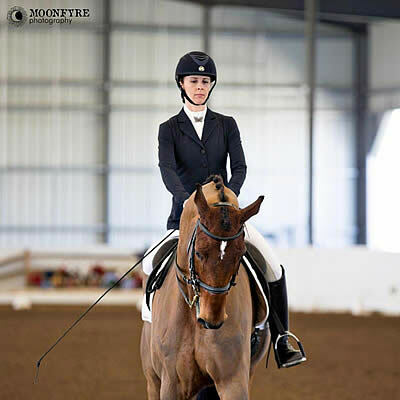 Once a month, the Dressage Radio Show becomes the Para-Equestrian Show Hosted by Lindsay McCall, of the United States Para-Equestrian Association, focusing on international FEI discipline Para-Dressage. Although Para-Dressage is the main event, listeners have the opportunity to learn more about the skillful U.S. Para-Driving Team, the Para-Reining discipline, Para-Vaulting, and the future of Para-Jumping. The para-equestrian dressage show will feature a line-up of guests including Olympians, Paralympians, trainers, coaches, professionals, amateur riders, young riders, and equine enthusiasts. The intention of the radio show is to educate, inform, and entertain listeners on the para-equestrian Dressage discipline. To learn more about the USPEA, please visit www.USPEA.org or e-mail President Hope Hand at hope@uspea.org. You may also e-mail the host of the para-equestrian segment Lindsay McCall at Lindsay@uspea.org. To learn more about the Horse Radio Network, visit www.horseradionetwork.com; to contact Glenn the Geek, go to http://www.horseradionetwork.com/contact/ or leave a voicemail at 270-803-0025. The Horse Radio Network is the voice of the horse world with listeners in over 40 countries. Eight different entertaining shows cover all aspects of the horse world and you can listen any time on your computer, MP3 player or smart phone. We believe that people own horses for fun and entertainment. Why else would you put up with the early morning feedings, stall cleaning, vet bills, long trips to shows, empty bank accounts and everything else that goes with being a horse owner? Our goal with these shows is to help your chores go a little faster and to put a smile on your face! Learn more at www.horseradionetwork.com. HORSES IN THE MORNING live M-F at 9am Eastern at www.horsesinthemorning.com. To view an online version of this press release, please visit: http://uspea.org/category/recent-uspea-press-news/. The USPEA is a network of riders, judges, national federation board members, and equestrian enthusiasts. The association gives athletes the ability to get involved and expand their knowledge and experience in the Para-Equestrian sport. The USPEA encourages para-athletes to participate in all disciplines under the para-equestrian umbrella. The USPEA is a recognized affiliate of the United States Equestrian Federation (USEF) which serves as the National Governing Body for the equestrian sport. This relationship between the USPEA and USEF is to encourage para-equestrian competitors, leisure riders, coaches, fans and enthusiasts to network and get involved with the entire equestrian sport. Ultimately the goal of the USPEA is to foster growth in the para-equestrian discipline. From growth in the number of participants to growth as a team, and growth in the experience and knowledge of all involved. From local horse shows to international Olympic Games, the USPEA will provide para-equestrians the knowledge of what they need to succeed. The USPEA connects with the International Olympic Committee (IOC), the Federation Equestre Internationale (FEI), the United States Dressage Federation (USDF), and USEF which provides Para-Equestrians the top equestrian resources. In June 2010, the USPEA earned its 501 (c)(3) status which has encouraged supporters to help supply funding to the Para-Equestrian Team as a recognized affiliate of the United States Equestrian Federation (USEF). For more information about the USPEA, please visit www.USPEA.org or contact USPEA President Hope Hand by e-mail: Wheeler966@aol.com or by phone: (610)356-6481.